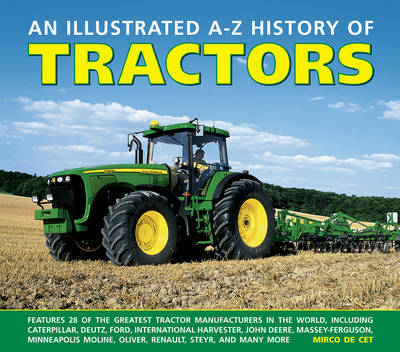 This is a comprehensive A-Z guide to modern farm vehicles, shown in over 475 identification photographs. It explains who coined the word 'tractor' and who gave Caterpillar their name; what Harry Ferguson did before he invented his three-point hitch, and the fascinating history of the John Deere Company. 28 manufacturers are described and illustrated in detail, each accompanied by fact boxes and key dates. It includes a complete timeline of tractor history, from sowing by hand in the 18th century and the sale of the first steam-powered tracked tractor in 1904, through to the name changes and mergers of the present day. It is illustrated with a stunning array of photographs that bring to life the machines that the pioneer tractor companies invented and manufactured. Agriculture has come a long way since the days of manual ploughs being pulled by oxen and horses. The benefits of technological advancements are easy to see in present-day farming - today's tractors are so sophisticated that they are able to calculate how long a job is going to take, the best way to carry it out, and sometimes even the best time of day to do it.This volume explores the compelling history of the major tractor manufacturers, from the 18th century through to the modern day. With its vibrant photographs and informative text, the book will enable tractor enthusiasts to appreciate the accomplished machines that help to provide for us every day.